So what are the practical implications of this paper? This paper is mainly aiming to address textbook physiology type questions so, like many scientific papers, isn’t very actionable on an individual level. Although it should go towards easing some of the anxiety of those who think that getting a glucose response from a banana or potato (~25g carbs) means that they are 'metabolically broken’, as this is normal and doesn’t necessarily mean that double or triple the carbohydrate intake will double or triple their glucose response. **** Previous studies have consistently found that different glucose loads (33g vs. 66g vs. 100g, 50g vs. 100g, etc*) produce a dose dependent insulin response but near identical glucose responses in healthy people. In contrast, people with borderline or overt impaired glucose tolerance (2h glucose ≥ 7.8 mmol/l) have greater glucose responses from larger doses of glucose. This begs the question, how is it that in healthy people, larger glucose doses don’t produce a greater glucose response? The American Heart Association (AHA) recently released a presidential advisory on dietary fats and cardiovascular disease (CVD) . 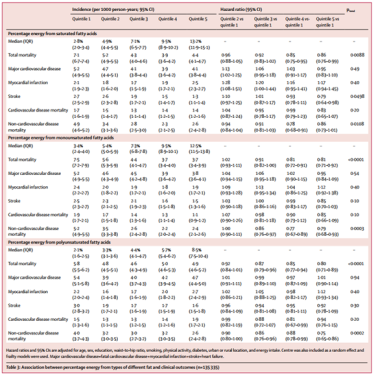 As you would expect from the AHA, they claim that “…randomized controlled trials that lowered intake of dietary saturated fat and replaced it with polyunsaturated vegetable oil reduced CVD by ≈30%, similar to the reduction achieved by statin treatment” and conclude that “lowering intake of saturated fat and replacing it with unsaturated fats, especially polyunsaturated fats, will lower the incidence of CVD”. I recently published a meta-analysis on the randomised controlled trials (RCTs) that replaced saturated fat (SFA) with polyunsaturated fat (PUFA) to see if this intervention reduces the risk of coronary heart disease (CHD) (blog) . I concluded that “available evidence from adequately controlled randomised controlled trials suggest replacing SFA with mostly n-6 PUFA is unlikely to reduce CHD events, CHD mortality or total mortality”. So not surprisingly I disagree with the AHA’s presidential advisory and will explain why below. Speaking of which, as my meta-analysis was published about a month ago some people asked if I thought the presidential advisory was a response to that. I doubt it. The authors would have to have been made aware of my meta-analysis (without there being significant media coverage), organise themselves, then write this paper and get it past review in less than month. They also didn’t cite it my meta-analysis, but one could argue that could be because of other reasons. I think it’s more likely that this is a response to the updated meta-analysis by Ramsden et al in April 2016 after recovering data from the Minnesota Coronary Survey . In this post I’m going to focus on the presidential advisory, mostly the RCT evidence, and not the media coverage. From what I’ve seen, the media coverage badly misrepresents the evidence. They claim SFA is bad and draw special attention to coconut oil, claiming that coconut oil is worse than butter because it has more SFA. 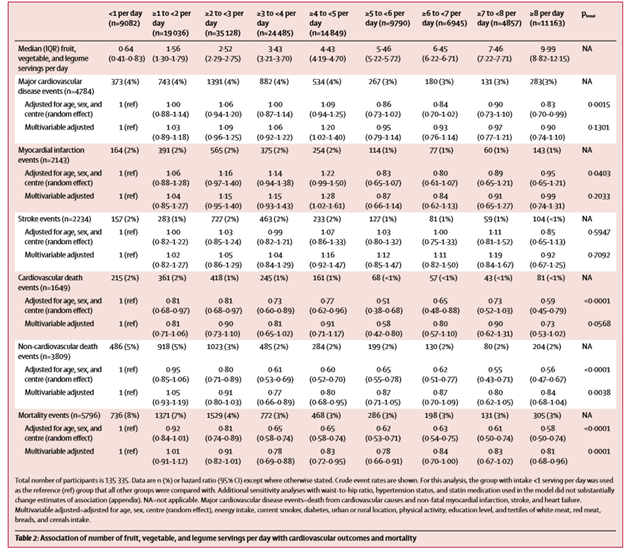 This is a position you can only take if you ignore that SFA also increases HDL-C (as a result SFA doesn’t significantly affect the total-C:HDL-C ratio) and HDL-C is associated with a lower risk of CHD/CVD, ignore meta-analyses of observational studies, and ignore the almost total absence of RCTs for anything related to SFA and CHD/CVD other than replacing SFA with PUFA . The conventional position is not that SFA is bad, but that replacing SFA with PUFA will reduce the risk of CHD/CVD. Replacing SFA with MUFA is not a particularly defensible position unless you only look at blood lipids and ignore meta-analyses of observational studies. I see there being two key issues in LAVAT. Firstly, that the researchers mostly omitted conventional margarines and hydrogenated shortenings (major sources of TFA) from the high PUFA diet . 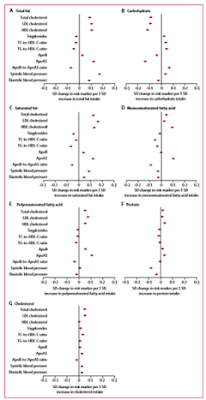 Secondly, the α-tocopherol (vitamin E) intake in the high SFA group was 9.4-fold lower than the experimental group (22.6 mg vs. 2.4 mg)  and was deficient, being only 16.0% of the current RDA (15 mg) . These issues were not reported in the monograph , which the AHA cites, but in the other papers that I cited here, which can be easily found by looking at the Cochrane meta-analyses (the AHA cites the one by Hooper et al 2015). The high PUFA group received a multifactorial dietary intervention that included advice to increase fish, shellfish and whole plant food consumption, advice to moderate sugar consumption and restrict shortening (a major source of TFA, and hydrogenated marine oils were a major source of fat in Norway at the time of trial), and the high PUFA group received sardines canned in cod liver oil . This isn’t mentioned in the main publications of the trial   ( is the one cited by the AHA), but is mentioned in the monograph , in an online version of the relevant chapter from the monograph , by Ramsden et al in the 2010 and 2016 versions of their meta-analysis  , and by Hoenselaar is his review  (and no doubt others have done the same in peer-reviewed journals). ODHS should not have been included with the core trials for failing to meet the TFA (2) and controlled diet (3) criteria. The AHA excluded DART and STARS because SFA was replaced with PUFA and carbohydrate, but included ODHS despite all the other dietary variables that are likely more meaningful than replacing SFA with carbohydrate, which the AHA doesn’t even think affects the risk of CHD/CVD. The AHA includes FMHS as part of their core trials and refers to the core and non-core trials as ‘randomised controlled trials’. However, FMHS isn’t a randomised trial. Some have suggested that it’s a cluster randomised trial (in this case that the hospitals, rather than the patients, were randomly allocated to go on the high SFA or high PUFA diet first). However, there is no mention of this in any of the publications from the trial. Even if the researchers did flip a coin to randomly allocate the hospitals, a cluster randomisation with 2 clusters is probably quite inadequate. Hooper et al 2012  and 2015  in their meta-analyses required at least 6 clusters and excluded FMHS for that reason. A couple of issues in FMHS demonstrates that how 2 clusters can be inappropriate. The control group in FMHS received more of a cardiotoxic antipsychotic drug called thioridazine in hospital N (0.82 vs. 1.79) and slightly less in hospital K (0.43 vs. 0.14), which averaged to an overall greater use in the control group (0.63 vs. 0.97)  . Also, the participants in the control group remained in the hospitals longer than those in the experimental group, which led to an overestimation of the effect size also points to inadequate randomisation. Fortunately the AHA correctly used the RR from incidence by age-adjusted person years to account for this. In addition, due to the more detailed dietary information provided in FMHS , Ramsden et al  was able to estimate TFA intake in both of the groups and found TFA intake to be lower in the experimental group in both hospital K (0.0 vs. 2.0% of total energy intake) and hospital N (0.2 vs. 0.6% of total energy intake). I don’t see there being any major issues in MRCT and is the only one of the four core trials that I categorised as adequately controlled in my meta-analysis. Some minor issues include: that the methods used to reduce SFA intake in the high PUFA group included forbidding “butter, other margarines, cooking-fat, other oils, fat meat, whole milk, cheese, egg yolk, and most biscuits and cakes”. This was very would be expected to reduce TFA intake in the high PUFA group to some degree and these methods were very common in the diet heart trials. And also that the participants were instructed to consume at least half of the soybean oil unheated and most of the participants achieve this by drinking the oil produced . This doesn’t represent the way in which oils are usually used, which is for cooking, and cooking causes heat damage to oils. Sometimes the exclusion of these trials was justified, sometimes it was not. On balance the non-core trials are unfavourable for the diet heart hypothesis. RCOT, MCS and SDHS are unfavourable, DART was pretty neutral, and while STARS and HDAT were favourable, they are both quite small. So the exclusion of the non-core trials helped the AHA get an impressive RR when conducting a meta-analysis on their core trials, which is part of what makes me wonder whether the criteria were designed to get such a favourable result. It seems that the AHA uses TFA and multifactorial dietary interventions as justification to exclude trials when it’s convenient and ignores these issues when it’s not. Should the Sydney Diet Heart Study be dismissed so easily? Some have suggested that the high PUFA group in SDHS had a higher intake of TFA due to the use of Miracle Margarine, which has been suggested to have been rich in TFA at the time of the trial . However, Ramsden et al   has provided some arguments suggesting that TFA is likely to be a major factor in SDHS. The AHA ignores this debate and uncertainty and confidently states that the study was comparing a high SFA diet with a high PUFA and TFA diet because the high PUFA group was given a margarine high in TFA. To get a rough indication of the TFA intake in the high PUFA in SDHS let make a few assumptions and rough calculations. (1) Assume that the Miracle Margarine used in SDHS was composed of 25-40% TFA, which based on study looking at the TFA content of safflower margarines of that time that was cited by Gutierrez* in her rapid response , and (2) assume that the high PUFA group replaced roughly half their original fat intake (which I think is a reasonable estimate given the change in SFA intake) with similar amount of miracle margarine and safflower oil. Therefore Miracle Margarine provided about 9.18% of total energy intake and TFA intake from Miracle Margarine would be 2.29-3.67%. 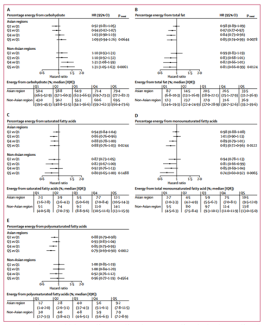 Ramsden et al estimated that TFA intake in the high SFA group was 1.6% . The high PUFA group were advised to restrict common margarines and shortenings (which are major sources of TFA), but let’s assume they were 50-75% compliant. Therefore, a generous estimate of TFA intake would be 1.60% in the high SFA group and 2.69-4.47% in the high PUFA group. 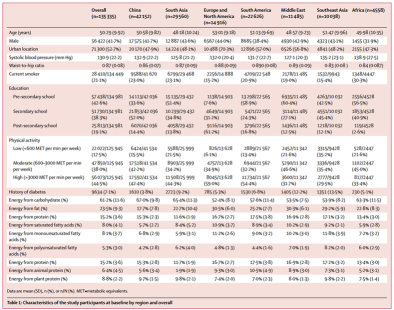 The RR in SDHS was 1.57 for CHD mortality and 1.49 for total mortality. The AHA cites two analyses of observational studies which found using a substation analysis that replacing 2% of energy from SFA with the same energy from TFA increased the risk of CVD mortality by 5%  and 16% , and total mortality by 16% . 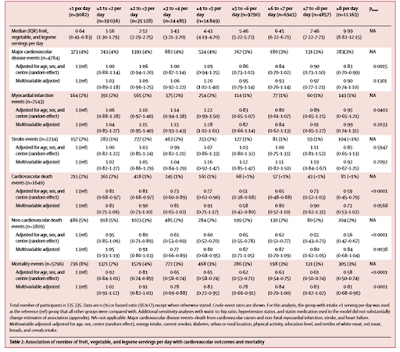 Even assuming a TFA intake of 4.47% in the high PUFA group, using the 5% increased risk of CVD mortality with 2% SFA > TFA substitution results in an amended RR of 1.50 for CVD mortality. So I’ll continue to be generous and use the 16% increased risk to calculate an altered RR in the table below. 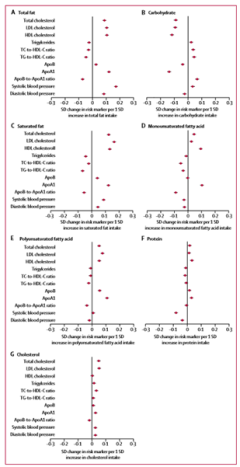 The RR is still comfortably > 1.00 whether you assume a TFA intake in the high PUFA group of 2.69% or 4.47%. In summary, in the bottom row in the table above I’ve granted that Miracle Margarine is 40% TFA (upper-end), assumed it contributed about 9.18% of total energy intake, granted that the high PUFA group were only 50% compliant in restricting common margarines and shortenings, and finally used the most favourable of the AHA’s cited data for SFA > TFA substitution. After doing all this to alter the RR to account for potential differences in TFA intake, SDHS is still an unfavourable study for the diet heart hypothesis!!! This should be a serious wakeup call to the AHA and other diet heart advocates. 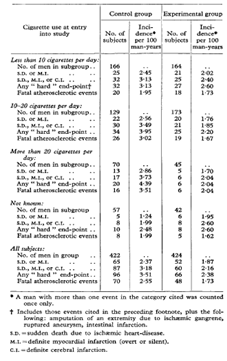 A major issue here is that the AHA doesn’t conduct a meta-analysis for total mortality. This is important because whole point of trying to reduce your risk of CHD or CVD is to reduce your overall risk of morbidity and mortality. One can argue that the AHA is justified to focus on CHD/CVD since that is the purpose of the association, but what good does it do to reduce your risk of CHD/CVD if doing so increases your risk of non-CHD/CVD morbidity and mortality, such that you would be no better off? This is particularly relevant for the AHA’s selection of trials. 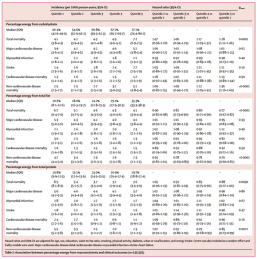 While the high PUFA group in LAVAT and FMHS had a lower risk of CHD and CVD mortality (RR = 0.80 and 0.59), they had a near identical risk of total mortality (RR = 0.98 and 1.01), because non-CHD/CVD mortality was higher  . As those trials were both many times larger than ODHS and MRCT, and therefore have a much larger weighting, the pooled RR of the AHA’s core trials for total mortality is 0.98 (CI = 0.90-1.07, P = 0.65). So will replacing SFA with PUFA reduce your risk of dying? Even with the AHA’s selection of trials and even while ignoring the major issues in LAVAT, ODHS and FMHS, the answer is still no.